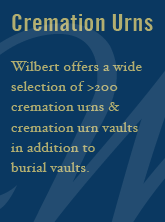 Wilbert Legacy Custom Series Prints offer families the ultimate in capturing and displaying the essence of their loved one. Photographs are chosen by the family from their collections for the creation of a one-of-a-kind collage. The unique, totally personalized image is then applied to the cover of the vault for display at the graveside service.